We are so excited to be releasing another amazing Watercolor Brush Markers Set! The Spring Garden Set is full of cheery bright tones, and our new Winter Wonderland Set contains gorgeous jewel tones and rich colors. We have even included a metallic silver brush marker! Altenew is giving away a $40 gift certificate to six lucky winners! 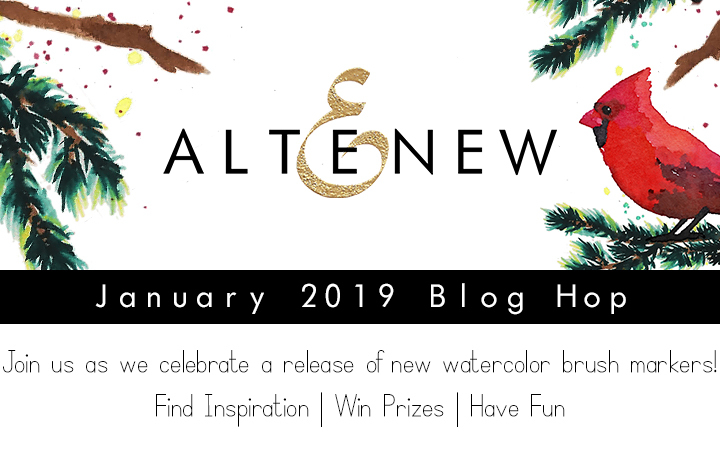 Please leave a comment here on the Altenew Card Blog and/or Altenew Scrapbook Blog by Wednesday, January 16th for a chance to win. Six winners will be announced on both blogs – three on each blog – on 1/19/2019. Amazing products! Love Altenew – never disappoint! I would love to try watercolor markers. The cards are beautiful. Thanks for a chance to win. I am so excited to see more colors added to the collection. I like that they are grouped as set of seasons so you get a wide variety of colors in each set. These look amazing!!! Can’t wait to see what others have made with them! I am so excited to try these watercolor brushes. Amazing! Such a beautiful collection! The possibilities are endless. Lovely samples from the designers, the colors are gorgeous. The colors are just fantastic for floral images, especially! Wow! These will create beautiful pieces of art especially for cards! These markers are gorgeous! And the cards created using them are wonderful. The Poppy stamps are gorgeous, so much detail. I can’t wait to try with the markers. Oh wow these look amazing, would love to give them a try with all the new sets I have recently purchased from Altenew! I am new to all this and am amazed at all of the creativeness that people have. I love flowers!!! Love the January 2019 reveal too!